Working in traditional and contemporary print, painting, sculpture and installation, Ms. Kronika explores lost languages, ancient and contemporary ruins, and construction. Her urban inspired photography, relief and embossment etching, wood and linocut works run in limited editions and mono prints. Through her painting and drawing, Ms. Kronika illustrates mythology, symbols, elements and archetypes. A recent example, the detailed illustrations paired with Grace Mary Kathyrnn’s prose for the Journeys Coloring Books series, is newly released to publication. Her sculpture and installations of found materials and clay continue a dialogue between language and symbolism. Ms. Kronika received her Associate of Fine Arts at Kankakee Community College, and her mixed media work is included in their permanent collection. During continuing studies, she created on-site installation work at the Governor’s State University sculpture park. These works are documented in both digital photography and original drawings. Ms. Kronika earned her Bachelor of Fine Arts Degree from Columbia College Chicago in 2009, where she focused on painting and drawing as well as printmaking and installation works. Ms. Kronika has worked with numerous art galleries, organizations, and leagues in Chicago and the surrounding suburbs. Her work with non-profit arts groups includes the Community Arts Council of Kankakee, Expressions Graphics of Oak Park, and internships at Anchor Graphics & The Center for Book and Paper Arts @ Columbia College. Additional freelanced work includes book illustrations, one-of-a-kind costumes, and painted portraits. Recent works include: Florals, Plein Aire or On-site Landscapes and Waterscapes, Fun Animals and more. 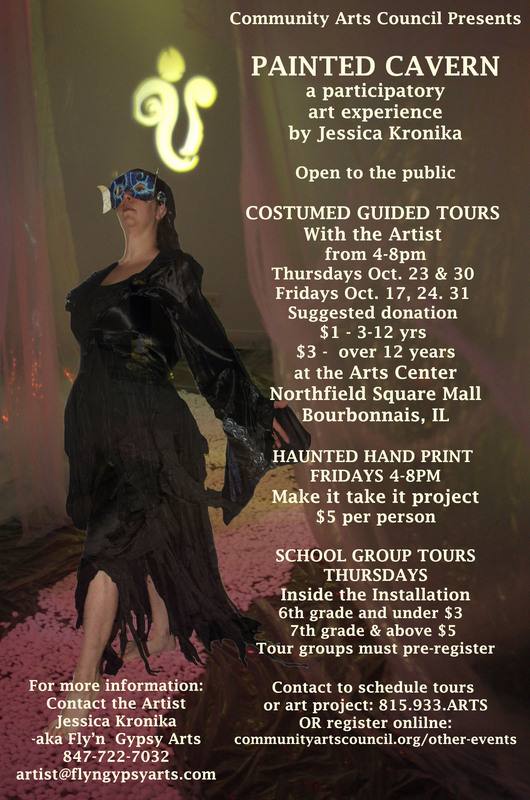 The 7th Symbolic Immersion Installation: Painted Cavern, during the month of October 2014 at the Community Arts Council of Kankakee County’s Arts Center location in the Northfield Square Mall, in Bradley, Illinois. Eight of Nine Original oil paintings and sets of all nine greeting cards are available for sale. Contact artist@flyngypsyarts.com for information. 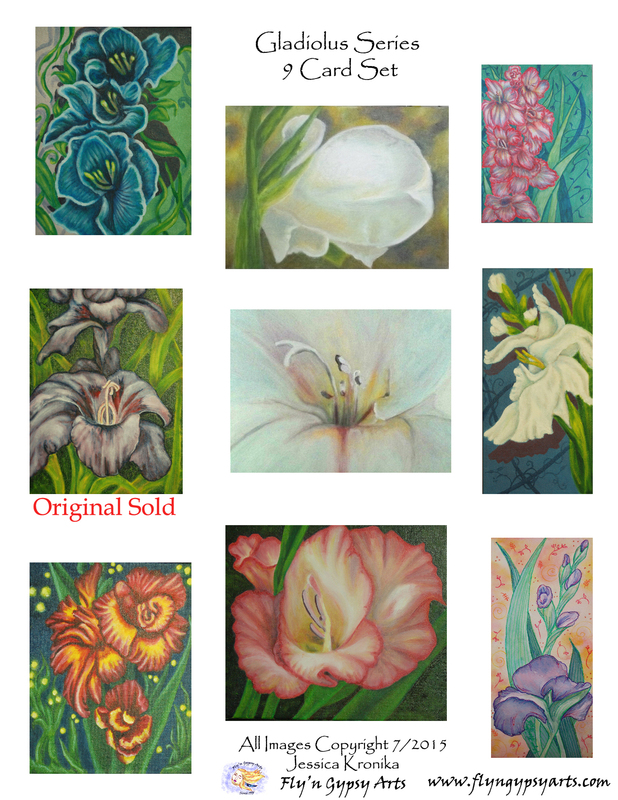 A series of nine new oil and watercolor paintings of Gladiolus flowers created for her exhibit “Nature’s Treasures” at Upper East Gallery in Momence Illinois during the annual Gladiolus Fest in July 2015. These works are now available for sale in original paintings and a limited edition set of greeting cards. My spiritual journey began thirty plus years ago when I got my first Tarot deck for Christmas and discovered a whole world of mystery, magic and mysticism. Since that day I have explored the mysticism in my native Catholicism, in Wicca, Native American-type Shamanic journeying, the Holy Grail quest and the mysteries of Qadishtu spirituality. Each step on the journey has taken me deeper into my Self and brought me closer to the Divine. My work with the Tarot has been foundational in my exploration. 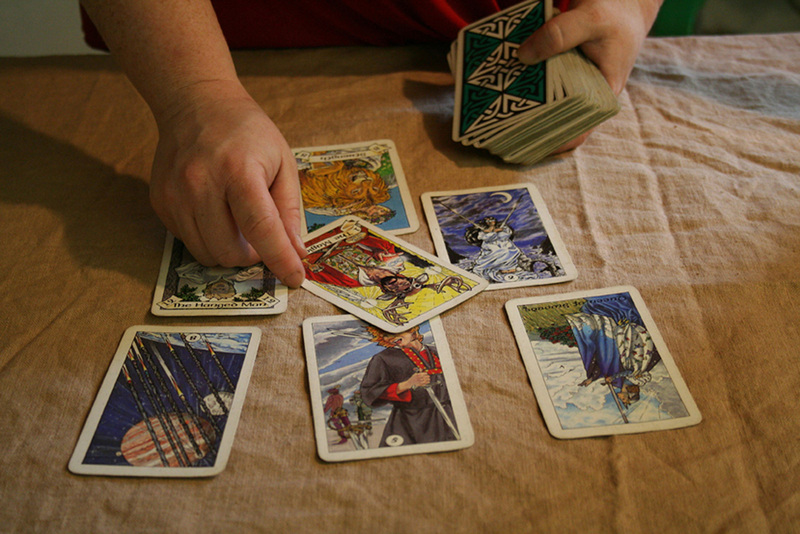 In addition to reading Tarot, I have taught several classes and workshops on Tarot. As a writer, teacher and mystic, world mythologies have always fascinated me. It is through mythology that we connect with the Cosmic Consciousness that unites all societies and each individual. I enjoyed researching these powerful beings and sacred days as part of creating the Journey through the Solstices Coloring Book. The symbols, deities, rituals and celebrations for each holiday were chosen for how closely each resonated with the holiday’s meaning. By diving deeper into these mysteries, we can attune ourselves more closely with the sacred essence of this part of the Wheel of the Year. Working with Jessica Kronika to bring this project to life has led me to a deeper understanding of each holiday and was a joyful experience. Blessed Be.